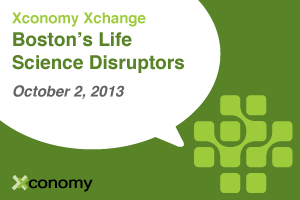 It’s just a few weeks to go until our next Boston-area biotech extravaganza, so it’s time to give you an update on what’s in store if you join us at “Xconomy Xchange: Boston’s Life Science Disruptors” at the Novartis Institutes for BioMedical Research in Cambridge on the evening of Oct. 2. The basic theme here is to focus on what it takes to put a disruptive biotech together, both as an investor and an innovator. So we’re giving the floor to a fantastic lineup of the CEOs and founding investors of some of the Boston biotech scene’s most radical startups—Bluebird Bio, Moderna Therapeutics, and Genocea Biosciences. How are these folks breaking the biotech mold? What insights can they offer about how to overcome the daunting challenges involved in conceiving disruptive life sciences ideas and turning them into promising companies? We’ll pose these questions and many more over the course of several unique discussions you can take part in. 6:00 pm: Welcoming remarks from Xconomy founder and editor-in-chief Bob Buderi, and another speaker TBA. 6:15-6:40 pm: The Genocea Biosciences story. Genocea co-founders Darren Higgins and Kevin Bitterman will discuss their experiences trying to create a successful startup in the notoriously tough area of vaccines. Built around an innovative technology spun out of Harvard University, Genocea has gotten the attention of a slew of big-name investors like Johnson & Johnson and the Gates Foundation. 6:40-7:05 pm: The Moderna Therapeutics story. Founding CEO and president Stephane Bancel and Flagship Ventures partner Noubar Afeyan will give us the lowdown on how, in two years, they were able to take a startup with an unorthodox drug development technology meant to be faster and cheaper than the norm and use it to land a nine-figure check from Big Pharma. It was a particularly impressive achievement given that the platform hadn’t yet been tested in human clinical trials. 7:05-7:30 pm: The Bluebird Bio story. Bluebird CEO Nick Leschly and Third Rock Ventures partner Neil Exter will discuss how they took a floundering, nearly two-decade-old gene therapy company known as Genetix Pharmaceuticals, and turned it into a biotech high-flyer with a nearly $700 million market cap in a matter of three years. We’re going to be sure to leave time during each session for the audience to jump in and mix it up with our speakers, so bring your questions—we’re hoping for some lively discussions. You can take part if you register here. See you at Novartis on Oct. 2.